It was quite a while ago - months, actually - that I made and photographed this ice cream, but I'm a bit behind on writing up a few of my recipes. 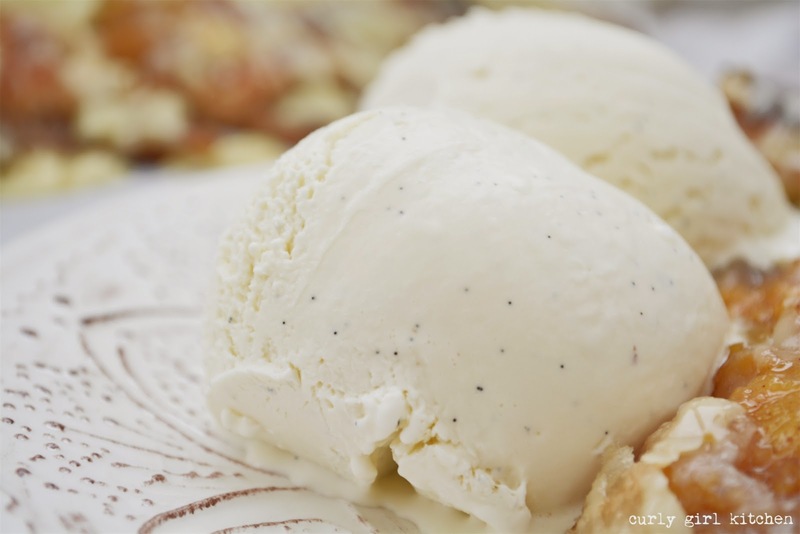 At first glance, it seems to be a very simple recipe with only six ingredients, but I've realized after making so many batches of ice cream over the last couple of years, that the least fussy ingredients result in the best ice cream. The delicate sweetness of raw honey, the richness of the egg yolks and the floral notes of vanilla bean all complement the pure flavor of the cream so beautifully. The hint of orange liqueur is subtle, and each smooth, creamy spoonful melts deliciously on your tongue. On a warm July morning when Jamie and I left Paonia,CO to drive back to Denver, we stopped first for an early lunch at a local cafe. We both ordered sandwiches - tuna salad on crusty bread for me - but we were intrigued by the freshly baked strudels cooling on the counters. There was peach, and apple, and maybe a few others, but since we had come to Paonia for the Palisade peaches, we had to try the peach strudel. Thin, flaky, golden brown layers of phyllo dough were filled with pillows of what might have been sweetened cream cheese, topped with soft, juicy peaches spiced with cinnamon, and then a crumbly streusel of some kind that somehow managed to stay crisp in spite of all the sweet juices released by the peaches. The strudel was the chef's specialty, and he rose early every morning to bake them for the morning diners. There really are no words to describe just how delectable that peach strudel was, although orgasmic would probably come the closest. 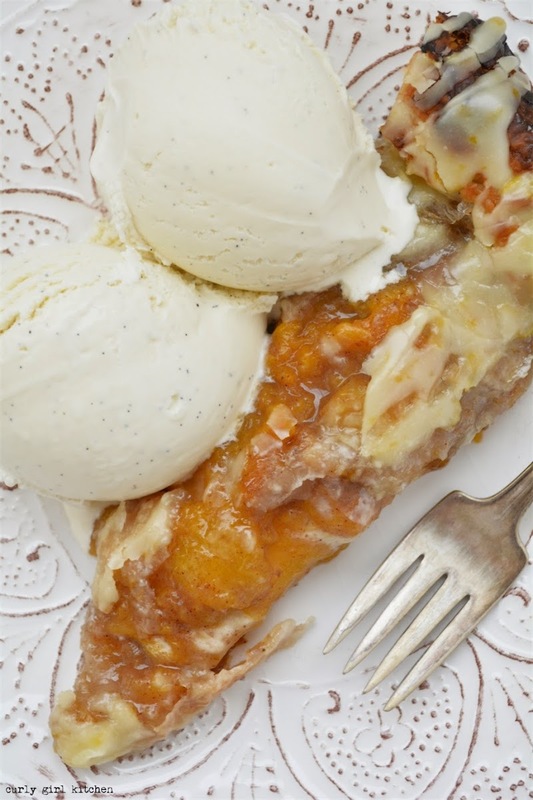 After coming home, our freezer filled with Palisade peaches, Jamie asked me on a weekly basis if I would try making the peach strudel. And so, I tried to re-create it the best I could, accompanied by the honey ice cream, of course, but my strudel just wasn't the same. Some recipes are best left a mystery, I think, only to be tasted on a hot summer's day, at a certain little unassuming cafe, in a little town in Colorado wine country. Combine the cream, milk and vanilla bean seeds in a saucepan. Bring to a gentle simmer over medium heat. In a bowl, whisk together the honey and egg yolks until smooth. When the cream starts to steam, gradually whisk a cup of the hot cream into the honey/eggs, then scrape it back into the saucepan. Cook the custard, whisking constantly, over medium heat, until the custard thickens enough to coat the back of a spoon. Remove from the heat and whisk in the liqueur. Pour through a mesh strainer to remove any bits of cooked egg. Cover the custard with plastic wrap, resting right against the surface of the custard, and refrigerate overnight. 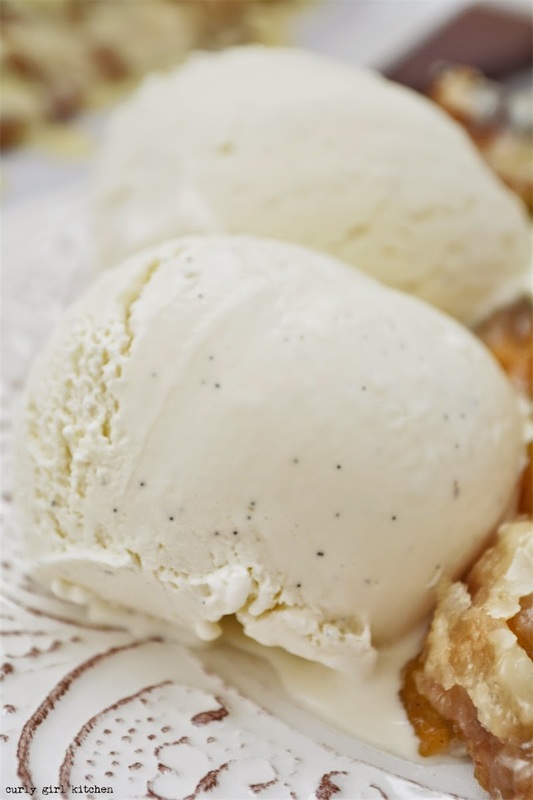 Churn the chilled custard in your ice cream maker according to the manufacturer's instructions, then transfer to a container and freeze until firm, about 4-6 hours.